1907.A contract for 400 tons of house coal was entered into at 10s. 6d. per ton, pit; to-day (in normal times) (The coal strike is now on (September, 1926), and available supplies are fetching exorbitant prices.) it is more than three times the price. The membership at Bozeat was growing and it was decided to deliver goods there. By the end of this year the Society had created a record in sales. The turnover for the year was £18,414, which sum was not again reached until 1916. The reserve fund had now reached £400. 1914.A resolution which savoured of municipal and general elections had been passed at the previous half-yearly meeting, and candidates for the Committee had to run the gauntlet in much the same manner as our Councillors and M.P.'s. A special meeting of members was called which the candidates addressed, and questions were put and answered. The only difference seems to have been that the candidates were thanked for attending. Our trade at Bozeat having grown considerably, and partly in compliance with the wishes of the Co-operative Union, a shop was rented and opened on July 20th. Shortly after this all the horrors of war were upon us; a state of panic existed as to food supplies; the employees were joining the colours; and the manager and Committee had a very anxious time indeed. 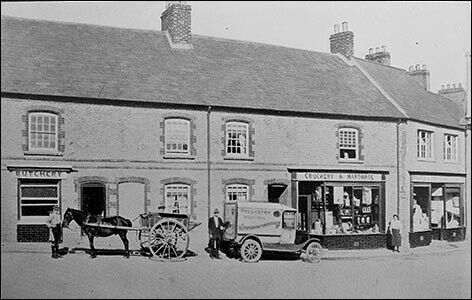 1919.The first branch shop at Bozeat, which was only rented by us, was now found to be unsuitable for our growing trade, and more commodious premises were secured and purchased. Plans were drawn up for extensive alterations, but these had to be pigeon-holed on account of the exorbitant price of building materials. Up to this period the whole of our transport had been done by horse haulage. The time was now considered opportune to reorganise on mechanical lines. It was therefore decided to purchase a steam lorry for coal haulage and a motor for goods delivery. On August nth the members decided to adopt the Collective Life Assurance Scheme. This scheme is considered by many members to be the best thing the Society ever adopted. There is certainly one good thing to be said in its favour and that is that it helps to meet a want when that help is most needed. 1923. In March of this year plans were prepared for extensive alterations to our Bozeat premises. The sales at this branch had now reached £6,500 per annum. The branch was officially opened on September 22nd, by the President (Mr. J. F. Catlin), who, in the course of his remarks, appealed for a trade of £200 per week at the branch. This achievement has now been accomplished. 1926.We have now arrived at the year of Jubilee. At the February half-yearly meeting a Committee was formed to carry out the festivities. This Committee consisted of the General Committee, the Educational Committee, the Women's Guild Committee, and two members of the staff. Furniture had been retailed by the Society for a good number of years, but owing to lack of showroom very little was sold. The time was now considered opportune to launch out in this direction, and a furnishing department was added to the already existing hardware department. So far, this venture has been very successful. We have always endeavoured to keep abreast of the times. When electricity became available from the main we were the first people in the village to use it. When the people recognised the intrinsic value of a pure, clean milk supply we were the only people in the place to provide it. On October ist, the old system of selling milk from open buckets was discontinued and the new system of selling Pasteurised Milk in sealed bottles adopted. It is said that "coming events cast their shadows before," but as there are no 'shadows' at the time of writing we should be foolish to assume that there are no coming events in connection with our progressive Society.